SAINT AUGUSTINE — New and returning students have arrived to Flagler College’s campus for the 2017-2018 academic year. Approximately 760 first-year students moved into residence halls this past weekend, and upperclassmen are returning early this week. New to the campus and now open to roughly 150 upperclassmen is residence facility Abare Hall, the college’s largest-ever construction project to-date. 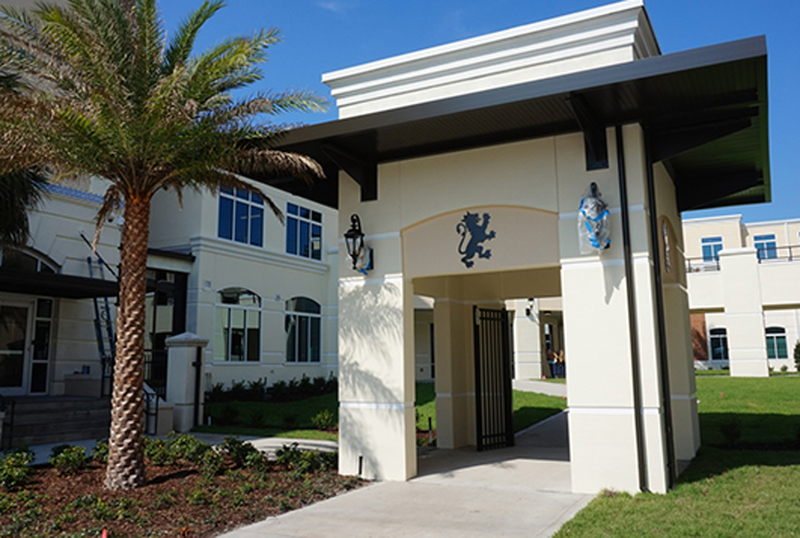 The complex, named after retired President Dr. William T. Abare Jr., sits on the west side of the college’s existing FEC Residence Halls on the banks of St. Augustine’s San Sebastian River. The residence hall is part of a $23-million complex that features a 55l space parking garage and an 18,900-square-foot, two-story Commons building that connects the existing FEC residences to Abare Hall. Flagler College is a private, four-year comprehensive college located in St. Augustine, Fla. The college offers 32 majors, 38 minors and two pre-professional programs. Flagler College has an enrollment of about 2,500 students, as well as a satellite campus in Tallahassee, Fla. U.S. News & World Report and The Princeton Review regularly feature Flagler as a college that offers quality education at a relatively low cost. A Flagler education is less than half the cost of similar private colleges, and competitive with many state universities. A relatively young institution (founded in 1968), Flagler College is also noted for its historic beauty. The centerpiece of the campus is the former Hotel Ponce de Leon, a National Historic Landmark opened in 1888 by railroad pioneer and Standard Oil co-founder Henry M. Flagler. For more on Flagler College. visit http://www.flagler.edu.